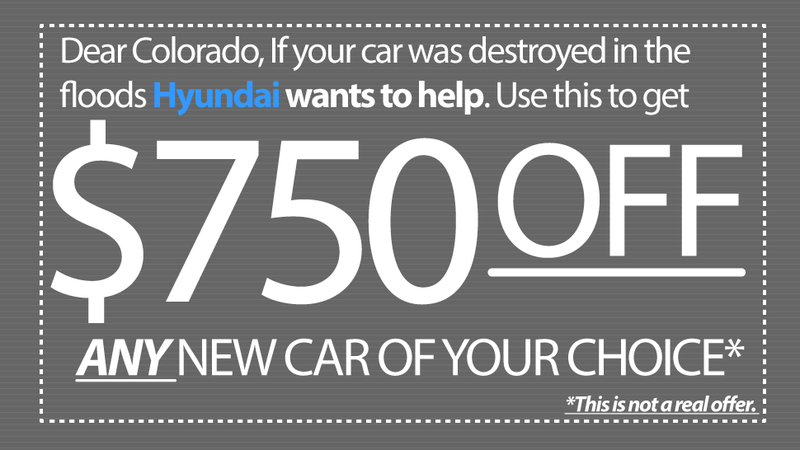 Early today Hyundai announced a $750 discount coupon for people in the state of Colorado who lost their vehicle during the recent floods. The catch: the credit can only be applied towards the purchase of any Hyundai vehicle model year 2013 or newer. A part of me thinks “Great job, Hyundai! Way to help out during a tragedy.” But another part of me sees this as leveraging an individual’s misfortune for direct gain. Inform dealers via Colorado Dealers Association of the program. Offer a $750 credit towards the purchase of ANY new vehicle purchased (image above). a) Watch media slow clap for your selfless move, Mr. Corporation. b) Like Scrooge McDuck in his sea of gold coins, bathe in your abundance of corporate goodwill. Hyundai is a car company. They know how important vehicles are to Americans. Instead of pushing product the brand should simply help people replace their car, whichever brand they choose. As it stands this is just a conquest cash rebate wrapped in feel-good marketing. Yes, shelling out $750 so that people could buy a competitor vehicle might backfire, meaning not a single one would buy a Hyundai. Also, this wouldn't be an easy program to administer from a logistical standpoint (how would a rebate for any vehicle work?). While the effort was very well intended, I would argue the return on being useful and selfless (read: less markety) during a time of need far exceeds the return on selling a couple of Elantras.